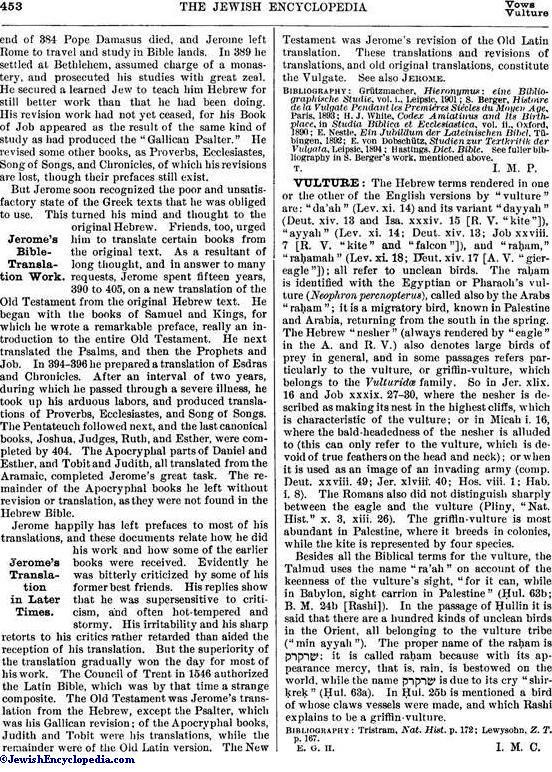 The Hebrew terms rendered in one or the other of the English versions by "vulture" are: "da'ah" (Lev. xi. 14) and its variant "dayyah" (Deut. xiv. 13 and Isa. xxxiv. 15 [R. V. "kite"]), "ayyah" (Lev. xi. 14; Deut. xiv. 13; Job xxviii. 7 [R. V. "kite" and "falcon"]), and "raḥam," "raḥamah" (Lev. xi. 18; Deut. xiv. 17 [A. V. "giereagle"]); all refer to unclean birds. The raḥam is identified with the Egyptian or Pharaoh's vulture (Neophron percnopterus), called also by the Arabs "raḥam"; it is a migratory bird, known in Palestine and Arabia, returning from the south in the spring. The Hebrew "nesher" (always rendered by "eagle" in the A. and R. V.) also denotes large birds of prey in general, and in some passages refers particularly to the vulture, or griffin-vulture, which belongs to the Vulturidæ family. So in Jer. xlix. 16 and Job xxxix. 27-30, where the nesher is described as making its nest in the highest cliffs, which is characteristic of the vulture; or in Micah i. 16, where the bald-headedness of the nesher is alluded to (this can only refer to the vulture, which is devoid of true feathers on the head and neck); or when it is used as an image of an invading army (comp. Deut. xxviii. 49; Jer. xlviii. 40; Hos. viii. 1; Hab. i. 8). The Romans also did not distinguish sharply between the eagle and the vulture (Pliny, "Nat. Hist." x. 3, xiii. 26). The griffin-vulture is most abundant in Palestine, where it breeds in colonies, while the kite is represented by four species. Besides all the Biblical terms for the vulture, the Talmud uses the name "ra'ah" on account of the keenness of the vulture's sight, "for it can, while in Babylon, sight carrion in Palestine" (Ḥul. 63b; B. M. 24b [Rashi]). In the passage of Ḥullin it is said that there are a hundred kinds of unclean birds in the Orient, all belonging to the vulture tribe ("min ayyah"). The proper name of the raḥam is ; it is called raḥam because with its appearance mercy, that is, rain, is bestowed on the world, while the name is due to its cry "shirḳreḳ" (Ḥul. 63a). In Ḥul. 25b is mentioned a bird of whose claws vessels were made, and which Rashi explains to be a griffin-vulture. Lewysohn, Z. T. p. 167.